When the ultra rich want to connect with nature and are in search of an adventurous trip they take camping to the next level by going glamping! Glamping is camping with a twist of glamour and luxury that goes beyond sleeping in a tent. Sure a tent is still involved, but the added features is what makes glamping spectacular. Canvas tents that range between 500 to 1,000 square feet are designed with the luxurious comforts of king sized beds, remote controlled fireplaces as well as private pools. One large benefit to glamping is the fact that most tents come fully equipped with ensuite bathrooms that feature double vanity sinks and showers. These luxurious tent camps are located across the globe, some in the most exotic and beautiful locations one can imagine. From Canada to India, and the Fiji Islands to Thailand, the locations are limitless. Here are ten extreme glamping destinations for the elite traveler. Paws Up Resort, also known as the Ritz-Carlton for camping, provides its ultimate River Camp option that offers safari-like accommodations. The River Camp location is nestled at the foot of the infamous Blackfoot River. The majestic river was the inspiration behind the novel and film A River Runs Through It. The River Camp site presents luxurious tents stocked with king beds, double sink vanities, heated slate floors and yes showers, which are all ensuite. Glampers are also privileged to electricity inside the tent as well as full cell phone and internet services so visitors are never entirely cut off from the world. The beautiful scenery can be taken in while sitting in Adirondack chairs on private decks. Taking it a step further, this glamping site comes fully equipped with a camp butler and camp chef that are ready to prepare three meals a day. These luxurious tents start at rates around $1,102 per night during the summer peak season. This ultra scenic location requires access either by boat from Tofino, BC or by a private seaplane that glampers can catch out of Vancouver, BC. The elite get to enjoy camping in an exclusive environment that hosts only 20 luxury guest tents, each three night stay will cost $5,710. The tents are presented with a rustic charm designed with antique dressers, tea tables and oil lamps. Glampers can enjoy king and queen beds, ensuite bathrooms with a large indoor/outdoor shower and propane wood stoves. The resort has numerous activities that glampers can take part in such as kayaking, whale watching, hiking and fishing. Lastly, glampers can enjoy the resort's Healing Grounds, which is an eco-safari style massage and therapeutic treatment center that all takes place in a tent. On the 14-acre private Dolphin Island, glampers have the privilege of staying in an upscale wood and straw hut also known as a bure. It has been lavishly designed by renowned interior designer Virginia Fisher. The bure meets every level of comfort by coming fully equipped with high ceilings, luxury bathrooms and air conditioning. The setting is breathtaking and glampers can enjoy the serenity while being surrounded by clear, turquoise water and colorful reefs. Amenities include massages and treatments as well as fresh Fijian cuisine. Glampers participate in the numerous activities offered such as bamboo rafting, diving and tapa-making classes. This tropical oasis costs around $3,130 per night. The Guerrero Lagoon is located 17 miles away from the capital city, Chetumal. El Chital provides an ultra private setting with only seven bungalows on site that will set back glampers around $1,750 per night. The bungalows come outfitted with deluxe bed linens, air conditioning and hammocks. Glampers here get to experience the spectacular views of the lagoon as well as lush gardens. Mangroves, orchids and exotic bird species add to the viewing pleasure. Glampers can choose to lounge poolside or lagoon side on hammocks while taking in the fresh air. Activities include free usage of kayaks and mountain bikes for glampers who want to tour the entire site. The Taj Exotica is an award-winning resort that offers ocean views all around its 64 palm-thatched villas. The villas are beautifully designed in classic Maldivian style with dark woods and rich textures. Amenities include sundecks, bathtubs overlooking the ocean and a personal bar stocked with the glampers choice of organic foods. Glampers can also enjoy in-room butler services when they don't feel like dining at either of the two prestige restaurants within the Taj Exotica. There are a number of water sports available to partake in as well as luxurious spa treatments to enjoy. This exclusive glamping experience starts at $1,000 per night. Sasaab offers the ultimate glamping experience under a 1,000 square foot white canvas tent located on the top of the banks of the Ewaso Nyiro River. The tent is glamorously designed with intricate Moroccan weavings, elegantly netted beds to protect from insects as well as a lavish private bath. Just outside of the tent is a personal plunge pool with a terrace to take in the spectacular views. Kenya offers an array of wildlife which can be viewed on the premises. Zebras, giraffes, elephants and gerenuks are just to name a few. Not to mention the social responsibility aspect this resort provides as it hires the local tribes people and supports a local school. 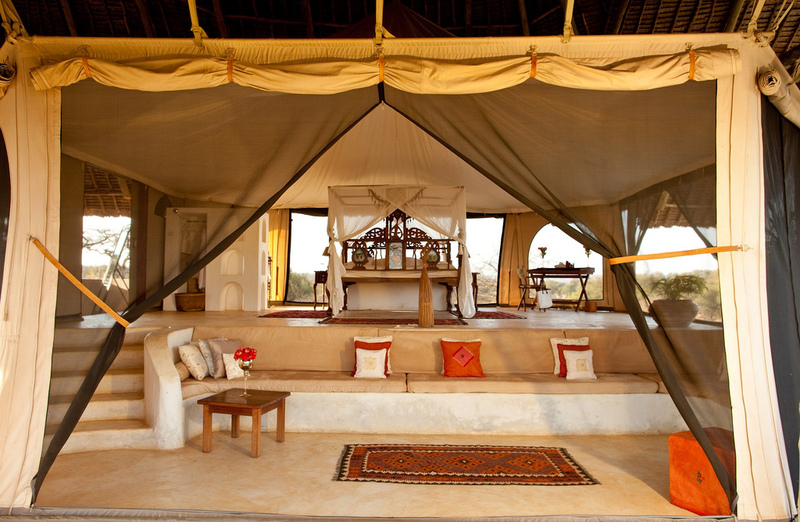 This luxurious safari experience can cost between the ranges of $3,270 to $4,020 for a three night stay. There is nothing like luxury amongst a grassy meadow within the ancient city of Mirano. The lavish resort, Canonici Di San Marco breathes Italian luxury that is surprisingly offered in two large canvas tents. Furnishings within the tent include mirrored armoires, ceramic sinks and linen tablecloths that are decorated with Murano crystal tableware. It is in Mirano that glampers can view the best preserved road system from the Roman Empire, the Roman grid. The Canonici De San Marco is also the perfect location for glampers that want to roam around nearby cities since it is only 20 minutes to Venice and Padua. It is during peak season that prices start around $279 per night for two people. The Serai, Jaisalmer is one of India's most luxurious desert camp and spa. It caters to the super rich with its tented Royal Suite that offers a private spa, outdoor pool and an organic garden. Glampers can bask in the outdoors of oasis like Jaisalmer which is in the center of India's Thar Desert. The landscaping is one of a kind that captures the Indian gazelle roaming along the rolling dunes and dusks. The Serai also offers its glampers ultimate relaxation with elite spa services such as cleansing scrubs and massages that are provided with all organic ayurvedic products. One night in the Royal Suite goes for around $1,116 for two people. The Banyan Tree Al Waldi is slated as the United Arab Emirates' first desert resort. Its unique features of offering all pool tented villas, Asian-inspired hydrotherapy spa facilities and a private beach attract the wealthy from across the globe. The villas are decorated with the finest furnishings as well as luxurious linens and silk brocade. The resort's Al Sahari Tented Pool Villa is the resort's priciest villa starting at around $877 per night. The Al Sahari caters to the elite who seek out a private, serene environment with modern luxuries. Glampers can take part in adventurous activities that include archery, biking and guided walks. The Four Seasons has been listening to what their customers want and have created a tent camp resort of their own. The renowned resort brings its luxury brand to tent camping in the jungle of Chiang Rai province in Thailand providing the ultimate glamping experience. The resort's superior tents offer amenities that include air conditioning, wireless internet and a refrigerated private bar. Glampers remain active at the resort with numerous activities which include visiting local cities, elephant treks, touring ancient temples and enjoying the spa amongst the bamboo jungle. The Four Seasons master chefs even offer cooking lessons to glampers who want to learn the secrets of traditional Thai, Laotian and Burmese cooking. This ultra posh camping experience is offered at rates starting around $1,729 per night.